A re-edit of a fundraising film I first edited of 2 of the Medjugorje visionaries during the Bosnian war back in 1992, during an alleged apparition from Our Lady. 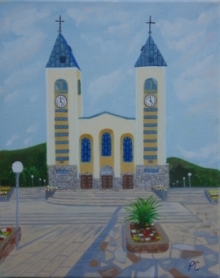 Tags: Medjugorje visionaries Bosnian war Our Lady Croatia kiely ave maria Gospa Marija Vicka Ivan Dragicevic pilgrim catholic Međugorje Gospa Jesus Isus Regina Pace Kraljica mira Hercegovina Siroki Brijeg Herzegowinia Medjugorje Germany God Bog Bok vjernici katolici katolik Krizevac Podbrdo Medjugorje Gospa Maria Gottesmutter Medjugorje Virgin Mary Maria catholic pilgrim miracle Croatia Hrvatska Madonna Our Lady Queen of Peace Jesus Christ. Or click to download the original video file: Medjugorje Apparition Room 1992 ( .wmv 12,8 Mb ).